It’s the most popular car in the United States. Since it was introduced in 1979, the hot little red sports car has sold over 10 million units. In 2008, it sold more than the Toyota Camry and Honda Accord combined. It’s also made entirely of plastic, seats one person under 3, and uses Flintstones-style foot power. 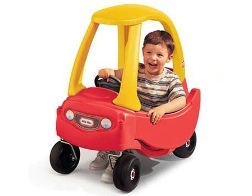 It’s the Little Tikes Cozy Coupe, and it’s finally getting its due. Americans have a love of cars that starts at birth, play with Matchbox cars and build model cars in our youth, and we continue to love cars until the government pries our drivers’ licenses from our wrinkled old hands. We’re a car loving people, and no doubt the Cozy Coupe has a lot to do with that. No doubt that’s why the Cozy Coupe is being honored by a Cleveland, Ohio, automotive museum for its enduring popularity.